Have some hoof boots lying around that you no longer use or are the wrong size, but haven’t gotten around to listing them on ebay? Thinking about trying a different style of EasyCare hoof boot? The EasyCare Hoof Boot Trade-in Program may be just what you need! 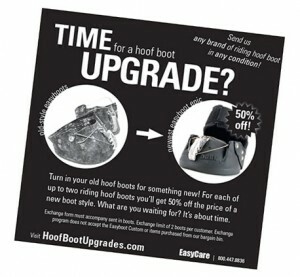 Send in your old pair of hoof boots and receive 50% off a brand new pair of EasyCare hoof boots. (The boots you send in must be riding boots, not soaking or therapeutic boots.) Send in four glue-on boots (must be other than EasyCare glue-ons) and receive 50% off four new EasyCare glue-on hoof boots. Visit the EasyCare website for complete details on the EasyCare Hoof Boot Trade-In Program!